I have now tested this on a GBA SP, and it works just the way it should. alepus reports some odd keyboard behavior on his GBA SP. Aparantly the "Wait a second" line never goes away unless he presses the WWW or E-Mail key on the keyboard. I'am not sure if this is a SP problem, and I don't have a SP myself. If someone else experiences the same thing, please drop me a line. -Updated- Since the people at www.gameboy-advance.net completely ignored my requests that they remove the copy of my tutorial from their website, I decided to contact their hosting company. Just a few days later the copy was removed from their website. Thanks to BigRedPmp for his work making the font. Here's the program, have fun! Minor bugfix, code cleanup, added keyboard detection messages. I've updated the test program, now it handles all keys except the top row function keys. It also features a caps lock feature, use shift+space to toggle caps lock. Using the shift key with any other key will return the symbol printed above the key. The multilingual chars (ascii codes above 127) are currently not implemented in the font I use, if anyone have a full ASCII table 8x8 pixel font suitable for GBA then please mail it to me and I'll include it. Anyway, here's the code, enjoy! The Gameboy Advance is a nice unit with great video and audio output capabilities. However, the input capabilities are restricted to only a bunch of buttons, that might be enough for games, but if you ever try to make something more serious with the GBA you quickly realize that more input capabilites are needed. 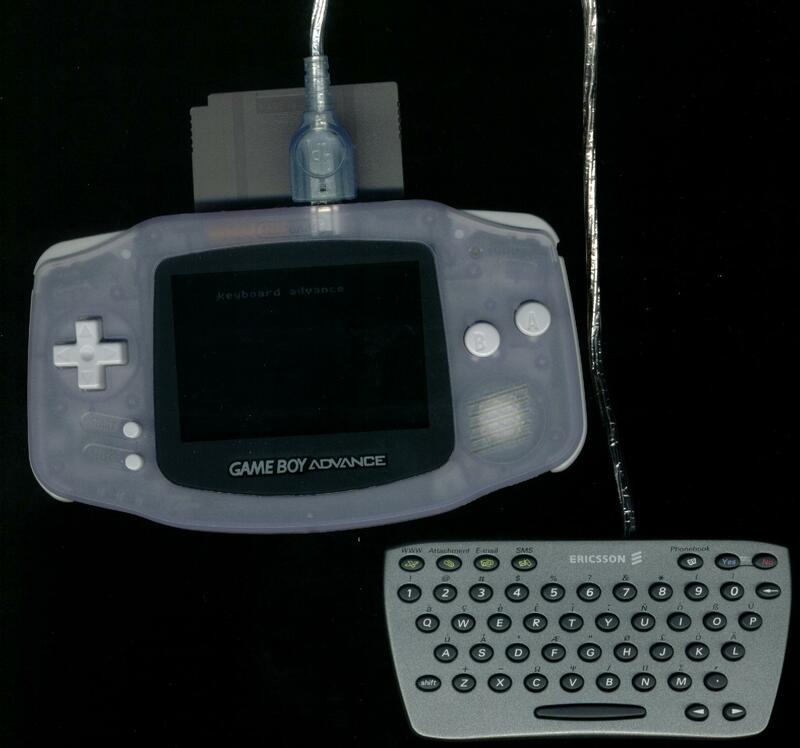 So, how about adding a keyboard to the GBA? 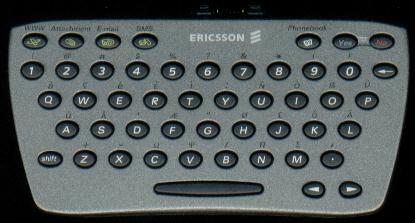 Model: Ericsson Chatboard CHA-01, normally intended for use with cellphones. It's small, it's cheap, it's perfect! First, you need a GBC or GBA link cable, and make sure that pin 1,2,3 and 6 are present! Many GBA link cables are made without pin 1 (Vcc) present. 1kohm is a suitable value for the resistor R, but you can really use anything between 470ohm - 10kohm. 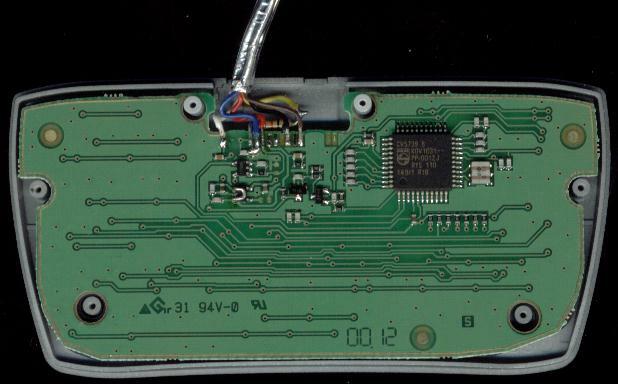 Both pin 1 and 5 on the chatboard must be connected to pin 1 on the GBA link port. Download a simple test program here (beta) if you want to give it a try. Due to how the keyboard works you have to push the SMS button and then wait a second before you can type anything. Not every key works right now, but I'am working on it. Of course, everything here is provided "as is", and I do not guarantee that the information on this page is correct, if you kill your GBA due to incorrect information on this page, then that's your problem, not mine.